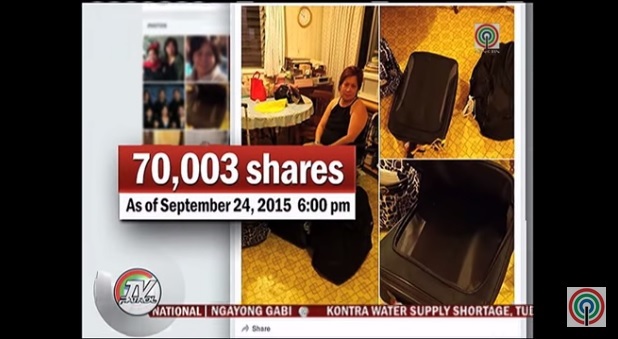 Manila, Philippines – “Kotong” victim Rhodora De Guzman appeared on ABS-CBN news to tell her side regarding the modus currently happening inside NIAA. According to De Guzman, when her bags were being x-rayed she was told by the x-ray operator that they’ve seen something strange in one of the bags. The baggage inspector whose back was turned from her, checked and inserted his hand inside the bag. But when he pulled out his hand he was already holding two bullets. That was the moment De Guzman was threatened by two security personnel who asked for his passport and green card. She then discovered the modus when the porter whispered to her that they will record what happened and they will interrogate and add notes on her record that she was carrying two bullets when she entered the airport. “Let’s end this, Ma’am. Just give them P500. That’s ok with them,” the porter added. De Guzman gave them what they asked for so as not to be bothered anymore. But prior to what happened to De Guzman the same modus now called “Tanim Bala,” was also experienced by 20-year-old Lane Michael White, an American missionary who was supposed to take his connecting flight to Palawan. White was shocked when he was told by two security personnel that his bag contained a 42 caliber bullet. They asked him to give P30,000 for him not to be imprisoned. But the American missionary refused to give anything. He was imprisoned for five days and was charged with illegal possession of ammunition. He was allowed to post bail and is currently out of prison. According to Jonathan Maliwat, PIO, Officer for Transportation Security, they will not let it pass and will charge employees who are engaging in illegal activities.